In 1966 a domestic cat gave birth to a hairless kitten in Toronto, Canada. It was discovered to be a natural mutation and the Sphynx cat, as we know it today, came into existence. This cat and a few other naturally hairless cats have been found worldwide. These have magically been produced by Mother Nature and are the foundation for this unusual breed. Cat breeders in Europe and North America have bred the Sphynx to normal coated cats and then back to hairless for more than thirty years. The purpose of these selective breedings was to create a genetically sound cat with a large gene pool and hybrid vigor. This is a very robust breed with few health or genetic problems. The Sphynx is not always totally hairless; there can be a fine down on the body, which makes thecat feel like a warm peach. Some light hair is often present on the nose, tail and toes. The texture of the Sphynx skin has been compared to a suede covered hot water bottle or a heated chamois. All colors and patterns are possible and may be presented at any stage of maturity. The color is seen in the pigment of the skin and the few hairs that they do have. One of the questions most asked is "Don't they get cold?" Well, of course, if it is too cold for you it will be too cold for a hairless cat too. However, these cats are smart enough to find a warm human, dog or cat to curl up with or they will get under your bed covers. This is a substantial cat, medium sized and strong, with adult males being larger than adult females. Sphynx have sturdy boning and good muscle development and should have a bit of a belly as if they just finished dinner. They have an open-eyed, intelligent face and a friendly expression. Because of the lack of hair that would normally absorb body oils, the Sphynx needs periodic bathing and ear cleaning. This is not a difficult task with a cat that has been acclimated from kittenhood with bathing and grooming proper for the Sphynx. Some people who suffer from cat allergies can tolerate living with Sphynx cats. However, depending on the type and severity of the individual's allergic reactions, there are still people who cannot live with this breed. The Sphynx was accepted for competition in the Championship Class by The Cat Fanciers' Association (CFA) in February of 2002. Sphynx lovers feel this is one of the most rare and unusual breeds in the cat fancy today...Sphynx are pure enchantment. Sphynx are rare and most breeders have a waiting list for their kittens. 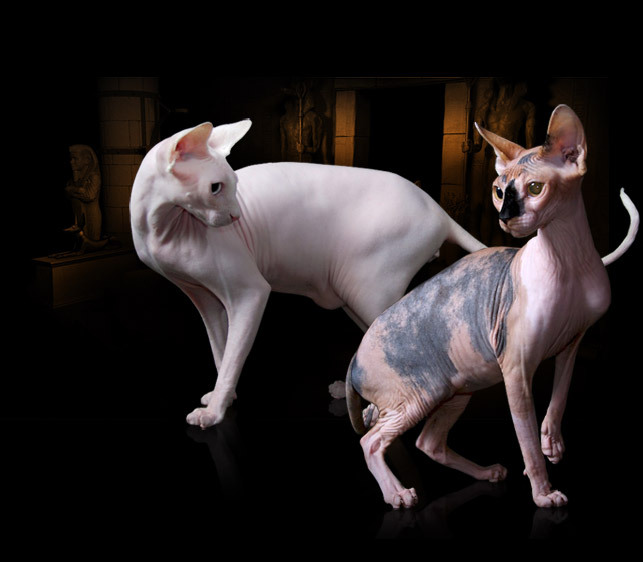 Pricing on Sphynx usually depends on type, applicable markings and bloodlines distinguished by Grand Champion (GC), National Regional winning parentage (NW or RW) or of Distinguished Merit parentage (DM). The DM title is achieved by the dam (mother) having produced five CFA grand champion/premier (alter) or DM offspring, or sire (father) having produced fifteen CFA grand champion/premier or DM offspring. Usually breeders make kittens available between twelve and sixteen weeks of age. After twelve weeks, kittens have had their basic inoculations and developed the physical and social stability needed for a new environment, showing, or being transported by air. Keeping such a rare treasure indoors, neutering or spaying and providing acceptable surfaces (e.g. scratching posts) for the natural behavior of scratching (CFA disapproves of declawing or tendonectomy surgery) are essential elements for maintaining a healthy, long and joyful life. There are CFA clubs devoted to the promotion, protection and preservation of the Sphynx breed. For more information, please send inquiries to CFA at cfa@cfa.org.